We have all settled well in to our new school day routine. Our topic for this term is "Pirate Sound Adventure", and Pirate Pete will be helping us to learn our sounds and letters. Class R have been focusing on counting, adding and subtracting. 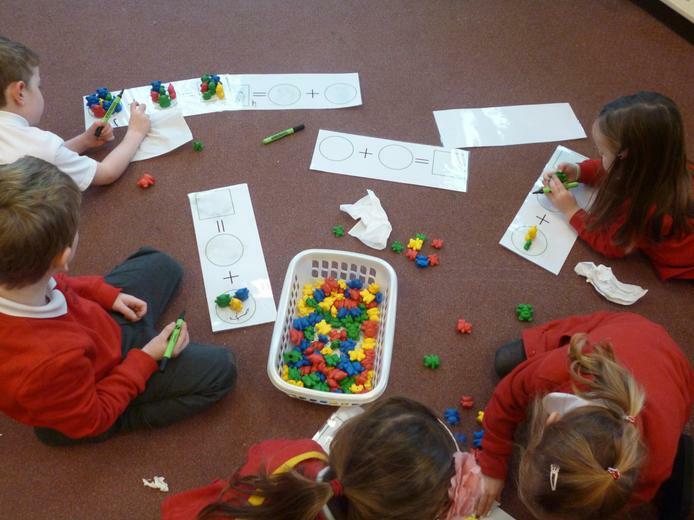 The children have been using addition and subtraction boards to create their own sums with compare bears. Class R have been completing their diary writing. The children have been working on their letter formations, as well as practicing their jolly phonics sounds. Our topic this term is 'toys and playtime'. We have completed observational drawings of old and new toys, as well as taking part in junk modelling. The whole school celebrated red nose day. The children all donated £1 to make their very own glasses. We worked with our buddies from Year 6 and it was very successful. Class R recently had a visit form the police. They brought some of the Police dogs to meet us and we had the opportunity to ask questions. We even got the opportunity to sit in a Police car. What a great experience!!! We have been working on our gymnastics moving over, under and around different apparatus. We have learnt about jumping and landing safely.